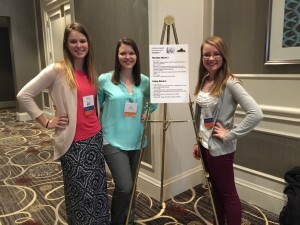 Emily Swale, Emily Cornett, and I had the wonderful opportunity to present at the Virginia Reading State Association (VSRA) Conference in Norfolk, VA. We prepared a presentation on how to integrate the arts – theatre, music, and visual arts – into literacy practices. We were very happy to have a t urn out of over 30 participants who were eager to learn from us! At first, this experience was a bit daunting… but once we got started we had a blast! We had a great balance of teachers from all grade levels, as well as classroom teachers versus reading specialists. We did a variety of activities that were engaging and FUN. At the end of our hour presentation, we had many teachers stop to give us encouraging feedback with enthusiasm. I would definitely say that our presentation was a huge success! Not to mention, we also had the opportunity to attend the conference and learn from so many brilliant teachers. Posted in: Reading Literacy and Learning, VSRA. How can we fix the wireless network? Some of the problems responsible for Longwood’s wireless network are caused by the reliance on the 802.11b/g standards which are less reliable and more inefficient than some of the newer standards. For example, according to many online resources, the standard 802.11b on average has a speed of about 11Mbps (Megabits per second), has a range of roughly 150 feet, and operates on the 2.4GHz frequency. The 802.11g standard has a higher speed of about 54 Mbps but the range of access drops to only about 50 feet and this standard also operates on the 2.4 GHz frequency. A few of the problems caused by the reliance of these standards is the higher risk of packet collision, the limited range of access which compels the network administration to install more access points which in turn increases the risk for EMI (electrical magnetic interference), and the fact that both these standards operate on the 2.4GHz frequency with is shared by so many other competing devices trying to transmit over those same channels. The 802.11b and the 802.11g wireless standards are widely used and in the right environment can produce good results. Also, many devices in use today are built with the capabilities of using these standards to transmit data. However, the 802.11b/g standards are not the best standards for the job when dealing with Longwood’s campus library. Likely all colleges have the general goal of improvement, and advancement. The 802.11b/g standards are older wireless standards, and there are newer and better standards that would solve many of the problems the Greenwood Library’s wireless network is facing. The 802.11n is one of these newer standards. 802.11n was released in 2009 and since has slowly been introduced into devices that are sold today. 802.11n is rapidly growing into the next widely used standard and rightfully so, due to the vastly superior benefits. When comparing the benefits of the 802.11n standard to the older 802.11b/g standards the 802.11n standard is far better on nearly every account. 802.11n uses both 2.4GHz and 5GHZ frequencies, while the 802.11b/g standards do not. Relating back to the highway metaphor, this means that there are now two separate “highways” from host to access point for data transmission, which gives the host and access point multiple ways to send a message, and also the ability to send multiple messages at one time. The 802.11n standard also has 40MHz channel bandwidth opposed to the 802.11b/g standards that use a 20MHz bandwidth. Again, using the highway metaphor, this means that traffic is able to flow faster because there are now multiple “lanes” or channels available to send messages on. The 802.11n standard also offers 15 non-overlapping channels while the 802.11b/g standards only offer three. Non-overlapping channels are important because the channels are far enough away from each other on the frequency spectrum to prevent EMI from neighboring access points and other devices. As stated in the previous blog submission, EMI causes packets to be malformed while in transit to either the host or access point. Not only does this increase the time taken to get the desired web service, but also floods the network with more packets (traffic) trying to fix the initial damaged packet. Another feature that 802.11n offers is the use of multiple input/multiple output (MIMO) to send and receive data. MIMO boosts throughput, and is one of the reasons the 802.11n standard has superior speeds and reliance. MIMO is not apart of the older 802.11b/g standards, and the result is only one message can be sent to either the host or access point at one time. This type of topology is called BUS (broadcast) topology. However with MIMO capabilities, 802.11n is able to send multiple messages to multiple hosts at the same time. This is made possible by using three or four antennas on the 802.11n access points. This is achievable because the 802.11n access point sends signals to the hosts using all of its antennas, and then noting the time each signal from each antenna took to reach to host and be transmitted back. The times recorded will then differentiate each host on the network and allow the access point to transmit multiple messages to multiple hosts. The 802.11n standard has a network speed of 100Mbps-600Mbps, but the common speed is about 300Mbps. When comparing wireless network speeds of the 802.11n and the 802.11b/g standards, on average 802.11n offers almost six times the network speed. Another reason the 802.11n standard is better than the 802.11b/g standards is its physical distance of wireless network connection. The 802.11b/g standards offer 50 to 100 feet of coverage, while 802.11n offers 160-230 feet of coverage. The distance an access point can transmit is determined by the frequencies used for transmission. At 2.4GHz the 802.11n access point is able to transmit about 230 feet, and at 5GHz it is able to transmit at about 160 feet. The 802.11n standard offers many benefits, but this standard would also help eliminate many of the problems Longwood’s campus library faces in concerns with its wireless network. The first problem mentioned was the higher risk/rate of packet collisions due to the limited number of frequencies and channel bandwidth available to the 802.11b/g standards. The 802.11n standard greatly reduces the number of packet collisions and can also efficiently handle a higher load of traffic due to packet collisions. This is made possible by the use of more frequencies available to the 802.11n access point, 2.4GHz and 5GHz, and also the larger 40MHz bandwidth channel. Another problem the 802.11n standard addresses in concern with Longwood’s campus library’s wireless network is the limited range and thus the need for a great number of access points the 802.11b/g standards require. As mentioned earlier, 802.11n access points have the ability to transmit over 160-230 feet depending on the frequency used for transmission. The maximum average for the 802.11b/g standards is only about 100 feet. This means that Longwood would need fewer physical access points to cover the same amount of area within the Greenwood Library. A fewer number of access points means a lower risk of EMI from neighboring access points. With a lower risk of EMI the ratio of damage packets to undamaged packets will drop. The last problem mentioned was fact that the 2.4GHz range of frequencies is over crowded with so many other devices trying to transmit data. The signals from these other devices often converge onto other signals and cause packets to become damaged. The 802.11n standard helps reduce this problem by offering transmission of the 5GHz range of frequencies which is much less crowded, and fewer devices use it. If Longwood University decided to implement 802.11n, wireless-n, technology as Greenwood Library’s standard for its wireless network, there would be a few steps in order to make the transition smoother. The 802.11n standard is a fairly new technology, but since its release in 2009 it has picked up support, and is now the dominate standard in sales. The main problem with adopting the 802.11n standard into the library is the large number of people without 802.11n capabilities on their devices. The first step needed to mark this transition would be to initiate a policy revising the required specifications of student owned laptops to be compatible with wireless-n technology. This policy should be implemented approximately four years before the actual transition to wireless –n technology for maximum effectiveness, but could be implemented one to two years prior with a few additional measures. Implementing this policy four years prior would allow the students who are already attending Longwood University without wireless-n capable devices to continue using their current devices throughout their college experience until all of the students who were enrolled under the old policy of laptop specifications have graduated. Implementing the revised policy for device specifications one to two years prior to upgrade would means that there would be at least two classes, the juniors and seniors during the upgrade, that would not have the capabilities to connect to the wireless-n network. Another step Longwood would have to go through would be to purchase 802.11n USB network adapters and offer them as rentals to students without wireless-n capabilities used the library’s resources. These adapters are small and simple to use by plugging them into an empty USB port on the user’s device. These adapters would allow students without wireless-n capabilities to connect to the library’s network without having to purchase new devices. An additional step Longwood could take would be to explore partnership opportunities with technology produces to try and set up a deal to supply Longwood students who do not have wireless-n capabilities with USB adapters at a reduced rate. They could also try to get a deal to have the technology producer install wireless-n capabilities into the student’s devices for a reduced rate, if the device could support the installation. The final steps Longwood would have to undergo would be the physical transition to wireless-n access points. The old 802.11b/g access points would have to be removed, and the new 802.11n access points would have to be installed. Like the 802.11b/g access points the wireless-n access points would have to be strategically placed to allow full coverage within the library, but also to reduce EMI. The 802.11n access points would need additional configuration and adjustments to the antennas to give the MIMO technology full abilities. If Longwood decided to implement the 802.11n standard as Greenwood Library’s wireless standard they would also need to implement a budget for the project. The main cost of this project would be the 802.11n wireless access points, and the physical labor costs associated with the installation process. It could be argued with the superior coverage distanced offered with wireless-n access points fewer access points would be needed to cover the designated area. Instead of spending more money on the current 802.11b/g wireless network to try and implement more access points to supply entire coverage or to displace the network load over multiple access points, the money could go toward the 802.11n project. It would solve the network problems, and cost essentially the same as revising the 802.11b/g wireless network. The wireless-n standard is currently the dominate standard in sales today. This likely means that in the next few years the majority of devise use to connect to networks are wireless-n capable. So why spend the money now to try and fix on an old standard, when upgrades are likely to come soon in the future anyways. So whats the specific problem with Longwood’s wireless network? Longwood’s current wireless network is compatible with 802.11b and 802.11g standards. These two standards are widely used among many different types of devices such as phones, laptops, printers, tablets and many others. These standards essentially set the rules of communication for both the host and the wireless access point. Without these standards, neither the host or access point would know how to successfully transmit or receive data to one another. These standards also ultimately determine the speed and range of access the wireless network has by specifying the range/number of frequencies and thus the amount of messages that can be sent at one time. A few of the more serious problems Longwood’s wireless network has, is caused by the reliance on these less efficient standards. For example, according to many online resources, the standard 802.11b on average has a speed of about 11Mbps (Megabits per second), has a range of roughly 100 feet, and operates on the 2.4GHz frequency. The 802.11g standard has a higher speed of about 54 Mbps but the range of access drops to only about 50 feet and this standard also operates on the 2.4 GHz frequency. Also both of these standards have a channel bandwidth of 20MHz. You can think of channel bandwidth with a highway metaphor, the more lanes a highway offers the faster traffic can flow, and the same is true for channel bandwidth. A few of the problems caused by the reliance of these standards is the higher risk of packet collision, the limited range of access which compels the network administration to install more access points which in turn increases the risk for EMI (electrical magnetic interference), and the fact that both these standards operate on the 2.4GHz frequency with is shared by so many other competing devices trying to transmit over those same channels. When using Longwood’s campus library as an example it is easier to uncover and explain some of these problems. During times when many people need to use the libraries resources the wireless network’s speed and reliance can suffer. This is likely caused by a combination of problems one of which could be a high traffic load over a narrow frequency range. 802.11b/g standards both use the 2.4GHz frequencies with 20MHz channel bandwidth to transmit and receive data, and as the number of wireless network users’ increase, the number of packet collisions and resulting damaged packets increase. When a packet is damaged during transit the host that received the malformed packet sends a special message to the sender to resend the packet. When the sender gets this special message, it resends the packet that was damaged. With large numbers of people transmitting data over the same set of frequencies many packets are damaged because it is easy for similar frequencies to jumble each other’s messages. And with this example, not only does damaged packets means a longer time the host has to wait for the packets all arrive undamaged, but it also means that even a higher level of traffic is being sent to notify the sender of damaged packets, which could damage other packets, and this could turn into a continual loop. Still using Longwood’s campus library as an example, another circumstance that could explain the unreliable and inefficient connect to the network during high occupancy times is the limited range of the 802.11b/g access points. Many times, for a large building such as the library, to have wireless availability throughout the building requires installing multiple access points. Multiple access points are mainly needed because the wireless range is limited, and depending on the standard and devices used this physical distance changes. The 802.11b standard has an average range of about 100 feet while the 802.11g is only about 50 feet. When using these standards in wireless access devices it is easy to understand that multiple access points would need to be strategically placed through the building in order to supply wireless connect everywhere. When the network administration has to install multiple access points in a single building they run the risk of EMI from neighboring access points. One means of combating EMI between neighboring 802.11b/g access points is to configure them to use different channels. There are only three channels, 1, 6, 11, which can be used because they do not cause cross talk interference with the other channels due to the fact that they are far enough away from each other on the frequency spectrum. The problem surrounding this short term solution is that the network administration would have to actually configure and make sure that each access points was laid out in an order so that no two neighboring access points use the same frequency (1, 6, 11). Even while implementing a correct mesh of access points using different frequencies, EMI is still a factor because there are still frequencies being transmitted from all of the access points. A good solution would be a solution that could use the fewest number of access points. Another problem that is tied to the 802.11b/g standards is the fact that there are many highly used devices that use the same 2.4GHz frequencies. A few of these common devices are cell phones, Bluetooth devices, car alarm signals, video devices such as chrome cast, and a big offender, the microwave oven. With so many devices trying to send and receive messages over a limited range of frequencies while other devices dispose of their radio wave byproduct in the same range of frequencies, messages often collide, get jumbled, and are sometimes just lost among the mist of chaos. As mentioned earlier, this in turn causes a higher amount of traffic over the network due to the additional special messages being sent to correct the damaged packets. The 802.11b/g standards are also designed as a BUS (broadcast) topology which means that only one host on the network can communicate with the access point at any one time. This also adds to the overall problem of an unreliable and less efficient wireless network during high occupancy times. When comparing these standards to the newer 802.11n standard, which is starting to be implemented in many of the newer devices today, 802.11n beats the older 802.11b/g technologies on every point of interest. Posted in: Redefining and Narrowing the Problem. Wireless technology is a growing industry, and is widely used as another means to connect to a computer network. Wireless networks operate by sending and receiving data over radio waves between the computer and the wireless access point. Longwood University has many of these access points installed throughout the campus, and a large number of students and visitors use them daily. Wireless networks bring along many benefits including, an increase in collaboration, more productive work, and it can easily add or remove users on the network. The issue that faces Longwood is that the current wireless network cannot handle the ever increasing amount of traffic. Longwood’s campus network, including its wireless one, can comfortably handle approximately 3,000 users at a time. This becomes a problem when Longwood’s 2020 vision states that they want to increase the number of students enrolled by almost 1,300 students. This will weigh heavily on the current wireless network because of how the wireless access point operates. When a group of users are connected to a wireless access point, technically only one user is actually connected and sending/receiving data at a time(Panko 152-53). This type of network topology is called a bus topology(Panko 152-53). Wireless networks work by sending and receiving data over a specific frequency, only one message can be sent at a time, because if the access point sent messages to two hosts at the same time using the same frequency, the messages would be scrambled. The wireless access point rapidly switches between connected users, so this effect is only noticed when there are a large number of users connected to the wireless access point(Panko 152-53). This also explains why the Greenwood Library’s wireless internet becomes very slow during very busy parts of the semester such as midterms and finial exam week. During these times the library’s network has the regular traffic of social media, streaming, regular research and homework related traffic with the additional traffic caused by the higher number of students in the library during these times. Wireless technologies were first seriously researched during the 1980-1990s. Many people back then dreamed of the world we live in today, where wireless networks are a common aspect of our daily lives. In the early 1990’s a few student enrolled at Carnegie Mellon University began planning and implementing the Wireless Andrew Project, which was a project that would make CMU the first college campus with a wireless network. This project was completed in 1999 and is a great accomplishment of the college. Wireless networks first were implemented at Longwood University during 2004 and has grown since. However, Longwood University still holds onto its’ wired infrastructure as its’ main method for connectivity. Stakeholders of this issue include Shentel, Longwood’s potential technology provider, Longwood’s network administration, students with wireless capabilities, students without wireless capabilities, online students, and Longwood’s budget committee. The main stakeholders would be the students, Longwood’s network administration, Shentel, and Longwood’s budget committee. Students with wireless capabilities would see this issue positively. They would like to see the wireless network renovated, and would be the main group that would benefit from it. Students without wireless capabilities would see this issue negatively because they would not have any direct benefits. This group would become the main opposition to the renovation of the current wireless network. Students without wireless capabilities would feel that the money spent on the wireless network should be spent to benefit all students. Another point of opposition is that Longwood does not require students to own computers with wireless capabilities. This group could use this saying, by Longwood’s own admission, wireless technology is a luxury, and should not have much money spent on it. Others may argue that wireless networks are less secure, but this is an ill-informed commonplace. An article from Cisco states “New security standards like IEEE 802.11i and the Wi-Fi Alliance Wi-Fi Protected Access 2 (WPA2) have emerged to match the robust protection previously found on wired networks.” Wireless networks can be just as secure, if not more secure than wired ones. I am a student at Longwood University and I am currently working on earning my Bachelor of Science in Business Administration concentrated in Information Systems and Security. I am also the Vice President of the ISYS Organization here at Longwood; I have taken Cyber Security, Management of Information Systems, and Network Communications. I am currently studying for two Cisco certifications, the CCENT and the CCNA Security. A large stakeholder in this issue are the students enrolled at Longwood University. When debating this issue, this group splits into two subgroups, students with wireless capabilities and those without wireless capabilities. The majority of student laptops have wireless capabilities, mainly because wireless capability is a fairly “old” technology. As technology advances, and time progresses, older technologies become easier and cheaper to manufacture, and thus are more widely implemented into devices. This is very true when you consider the amount of memory offered in laptops today compared to 15 years ago. A desktop computer with 10-15GB of memory was considered a lot, and now laptops are made with multiple Terabytes (1TB=1000GB). With this said, and the growing number of wireless networks implemented throughout our daily lives, computers with our wireless capabilities are out dated machines, that will probably be upgraded within a year or two. One concern that students have is security. It is a common misconception that wireless networks are less secure than wired ones(Five Myths of Wireless Networks). When you really think about it, this is very untrue. To breach some companies/universities networks all a hacker has to do is wear a university logo, put on a back pack, walk into a building with an Ethernet cord, sit down and plug into an empty wall jack. But with wireless networks, the hacker would have to authenticate himself at least one, sometimes multiple times before having access to the network. Most serious companies/organizations have authentication required on Ethernet as well, but some do not. Also it is very simple to configure a wireless network to encrypt the data flowing over the network and out into the internet. What’s the problem with Longwood’s wireless network? We live in a technologically advancing time, and a country that has very strong private/intellectual property laws and free markets. These attributes along with others create an ever increasing push for a higher level of technological knowledge. Information technologies are a part of this drive for more advance technologies. Wireless communications and more specifically wireless networks, are generally no longer considered a new technology. Longwood University first implemented wireless access to parts of their network in 2004 for its users. Wireless access has been implemented in more parts of Longwood’s network over the years, but the demand for it has grown even faster. According to Longwood’s 2002 vision to gradually increase the student population to 6100 students, each year more and more users will access Longwood’s network wirelessly. At times the wireless access to the network is pleasantly responsive and productive to use. On other occasions, frequently during “busy times” such as weeks prior and during exam week, midterms, class registration, and when new downloadable device upgrades are released. One example of a downloadable device upgrade was the new IOS 7 released by Apple Incorporated for Apple devices such as Mac’s and IPhones. With the larger number of students accessing Longwood’s network the wireless network is not the only part affected. During these “busy times” the wired Ethernet network, which is a part of Longwood’s whole network, is also affected. Longwood’s connection to the Internet is provided by Shentel. Longwood Purchases a set amount of speed from Shentel and divides that set amount among the different sections of Longwood’s network like the student dorms, and the campus network. As it stands now, this Issue is not drastic, however unless upgrades are made to Longwood’s network this problem will persist and grow worst. Longwood’s vision for the next six years estimates an additional 1,300 students. It is logical to assume that as time progresses, this problem will exponentially grow in correlation to the number of students enrolled at Longwood, and accessing the network. The stakeholders that would support upgrading Longwood’s wireless network would, for the most part, be the same groups of people that would receive the direct benefits of the upgrades. These people would most likely be either students or teachers with wireless capabilities. The groups of people who would support upgrades to the wireless infrastructure would argue that the changes made would promote higher productivity, efficiency, collaboration, save money, and potentially allow online students with more benefits. The stakeholders that would view upgrades to Longwood’s network negatively would most likely be the groups of people without wireless capabilities. These groups of people would argue that money spent on the wireless network would not benefit everyone, and Longwood itself does not require student laptops to have wireless capabilities. This might support their argument that the wireless network is more like a luxury instead of a necessity. These groups might also argue that the current network is only seriously affected only three or four times a semester, and the problem is not serious enough to spend money on. The idea of implementing more lectures and programs which include intervention on drinking while on college campuses sounds easy enough but some resistance may hold back this idea from emerging. The problem with implementing this idea is that faculty and staff would have to do some research on how effective some of these programs are and if they actually work. Faculty also would have to schedule these programs in, and figure out who is going to provide the speech/ lecture. Multiple other things have to occur for this to actually happen but to make it brief the real resistance on implementing these programs and lectures is TIME and MONEY. Other resistance comes from a different source which doesn’t include institutions but individuals. Students are the greatest resistance to these programs. One of the challenges of introducing these programs in attempts to reduce college drinking problems is the variety of the different groups and subgroups to be addressed and their diverse agendas and needs. Students identify alcohol as freedom and its their choice whether to have a few drinks or not. Student’s can resist by not showing up to the programs, not paying attention to what the lectures have to say about drinking, and also by making their own mind up on whether to drink or not. Without some students making poor decisions while drinking or drinking irresponsibly resistance would not be an issue. Drinking on college campuses is a problem an also a growing concern. Most of the students on college campuses are affected by college drinking, whether they are drinking or not. The problem with drinking isn’t that students drink, its the consequences that follow. According to the NIAAA (National Institute on Alcohol Abuse and Alcoholism) on college drinking, about four out of five students drink alcohol and about half of those drinkers are binge drinkers. This is a growing concern for the student oriented community because the consequences of some students that drink include death, assault, sexual abuse, injuries, and also a decline in academic success. Me, in my opinion, believe that students (especially freshman or new coming students) partake in consuming alcohol because when they leave home to go to college to some students it may feel as a sense of freedom and a right to drink whenever they please. With little to no information out of high school some students are infected by the consequences when introduced to alcohol. Through strategies like brief lectures and intervention programs that specifically target individuals on their problems or potential problems of drinking may be effective. Through my own experience of becoming a freshman for Longwood University the only things i heard about drinking through brief lectures are “if you drink, you can get in trouble with law enforcement.” How is that suppose to warn students about the consequences of drinking? To embed some of these students with the possible consequences of drinking i say implement these lectures and programs mainly to target freshman and new coming students and these lectures should include all the risks of drinking, how these risks may interfere or interrupt their academic success and goals, and how to reduce/ monitor drinking, and how to handle high risk situations. When researching and discussing the proposal at hand of adding one question to the confidential questionnaire handed out to all rising freshman at Longwood, which would ask students whether they feel comfortable with living with an LGBT individual, the main opposition that arose was that asking a student this could be compared to asking if the student in question is comfortable with living with someone of a certain race or ethnicity. Essentially, asking this question could be considered a gateway to saying that by giving students the opportunity to choose not to live with someone of the LGBT community; we’d be giving them the option to discriminate against these students, but the simple truth is that discrimination already occurs all around us, both on this campus, and in the world, and nothing can completely make that go away. What can be done, however, is to offer a safe way for students to express their beliefs about having to share a room with a member of the LGBT community, which not only gives these students a chance to make their own choice about whether or not they feel comfortable with dealing with this issue, but also to feel heard on the issue, but also could protect both themselves and the school from the potential fallouts that may arise from having to deal with one potential roommate coming out about their sexuality, and the other one not being comfortable with it. But the sad truth is that this is not the case, and probably won’t be for a long time. Putting this proposal into action will not only help LGBT community members to be placed in living arrangements where they feel it will be accepted for them to completely let themselves be whoever they choose to be, but also those individuals who either do not agree with, or maybe don’t necessarily have a problem with the LGBT lifestyle, but just don’t feel comfortable having to be surrounded by it in their own living space, it will give them a chance to choose, rather than be forced into something. Both sides would be positively affected by the implementation of this tweak to the questionnaire, because it will give both sides a chance to be heard, and I’m hoping in the end, having the choice will provide for more campus-wide acceptance of the LGBT lifestyle, since it would no longer be forced upon students, but they will get to decide what they feel comfortable with. Posted in: Redefining and Narrowing Your Scope. On the quest of obtaining any goal, one will meet resistance… Whether it be from instituting a green program for a university or running a 10k, something will always try and hold you back. With the concept of bettering the sanitary conditions and increasing food quality at the Longwood Dining Hall, one must face the crispy and sticky enemy which may not always be apparent. Change, not everyone is open to it. Many people may oppose this idea because they believe things are perfect the way they are. This is the way it has been and this is the way it should remain. The veteran dhall employees may be accustomed to the rituals they undergo on an everyday basis and therefore not wish to change. Or from the management side, they are used to allocating a certain financial portion to food and cleanliness and not wish to change that. Financially, maybe they are already using the maximum amount of expenditure on dhall already, and this would mean moving money around and allocating it differently. In an ideal scenario, everyone gets what they want. There’s taco Tuesday, Wasabi Wednesday, and the dhall workers cook what ever you want. We know that this will never happen, and is an absurd goal. How ever the antithesis of this is Hamburger Helper month with a side of vegies in a bag. There must be a happy medium where both parties can successfully be content with the outcome. An example would be to have a eat clean station, that is separate from the greasy foods. They already offer some organic substitutes why not this? Maybe students could order ahead of time to allow the cooks to prepare their foods individually (also a heavenly thought but not practical). In the end resistance will be met and compromises will have to be made. This assumes that they even realize there is a problem. Resistance to change and financial restrictions could be the ultimate downfall of this proposal, and many like it. We must start small and from that a ripple will form propelling the winds of change in a positive direction. The groups that would be resistive to my proposal, that being to put in a hydrogen fuel cell, would be Longwood University and the logging company. The reason Longwood University would be resistive would be because of monetary reason. Longwood has already spent 14 million of their biomass generators. For them to shall out more money to implement a hydrogen fuel cell could possibly be not in their favor. Longwood is proud of the 14 million they spent on upgrading and expanding the biomass generator. Therefore, it has become an institutionalized thought that what they are doing is right. They believe that they have made Longwood into more of a self-reliant university. In a way, they have but they have put a detriment on the student’s health and on the environment. The logging company would be against the change because they do not have a plan for sawdust that would start accumulating on their plants. This would not be in their favor because they would have to implement a new way of taking care of the sawdust. Moreover, being humans we are creatures of habit meaning that people are more resistive to change. SO for the logging company to change its being scheme to fit the new amount of sawdust would not be in their favor. However, even though they would be resistive the logging companies would not have a say in what Longwood does. Sure, they could try but ultimately Longwood would have the final say on whether the change would happen. Out of the two major groups that would, resistive to my proposition only the logging company would resentful. The reason why I believe that Longwood would not be resentful is because in the long run the hydrogen fuel has the potential of eventually paying itself off. In addition, the hydrogen fuel cell can go through a proof of concept. During this phase, it could offset the 20% of the power that is made from fossil fuels. The logging company however, will be resentful because in the long term for them there is no win for them. They will have a new amount of sawdust that they will not have a plan for sure eventually they will have to implement a plan but short term they will be annoyed that Longwood did this. Therefore, what exactly are the extremes of the arguments for and against implementing a hydrogen fuel cell. Well the argument against a hydrogen fuel cell would be to do nothing. The reason why this is extreme is because Longwood prides itself on being a green university but having a biomass generator contradicts everything they say. Now the extreme for implementing a hydrogen fuel cell would be to have it take over all of the power requirements for the university. This is extreme because a most hydrogen fuel cells are in their prototype stage. They do work but to have one take over all the power requirements without first having it go through a testing phase would be irresponsible. The happy middle for everybody would be to have the hydrogen fuel cell take over the 20% of the power usage that is created by the fossil fuels.